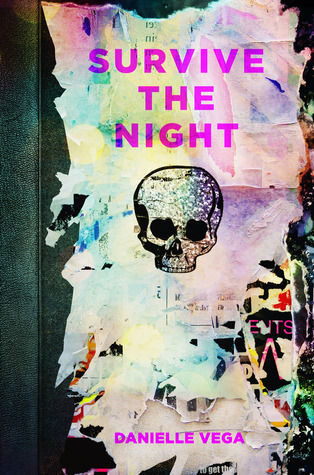 SURVIVE THE NIGHT is the latest horror novel from Danielle Vega, and we're thrilled she's stopped by to tell us more about it. Danielle, what was your inspiration for writing SURVIVE THE NIGHT? Like my debut, THE MERCILESS, SURVIVE THE NIGHT was based on a true story. There was actually an illegal rave held in the NY subways. I didn’t go, but I found the pictures online and it looked amazing. No one died, but it occurred to me that this would be a gorgeous backdrop for something really twisted. The strobe lights, the rats, the music…the setting was just begging for a gruesome murder. The first scene in this book was impossible. Casey was just getting back from rehab, where she’d been sent to deal with her addiction to pain relievers. But the thing is, she was really addicted to Shana, a magnetic bad girl she met while in the hospital for a knee injury. I had to set up Casey’s backstory, juggle about a million different relationships and make it believable that Casey would go off with Shana—all in about eight pages. It was such a tricky scene, but I think it worked out in the end. My favorite scene to write is just a few chapters later, when Casey first hears about a rave called Survive the Night. I won’t spoil it for you, but you can expect sparklers and clown makeup and lots of romantic tension. There are some absolutely stunning YA horror novels out right now—books by Nova Ren Suma, Micol Ostow and Courtney Alameda have completely blown me away. But what’s been fun about writing THE MERCILESS and SURVIVE THE NIGHT is that they feel like throw backs to books I loved when I was a teen—anything by Christopher Pike or R.L. Stine, for example. How long did you work on SURVIVE THE NIGHT? Because of the magic of email this is an easy question! I had the idea for writing a book about an illegal subway party gone wrong in January of 2014, and finished the outline by the end of the month. On August 19th, I sent my final email to the copywriter so, start to finish, it took about six and a half months. This sounds so fast in hindsight! Be careful what you Google image search. What do you hope readers will take away from SURVIVE THE NIGHT? Oh dear. This is a much more complicated question but I always swore to myself that if I got published I would be completely truthful about the long, hard road to get there. I wrote my first book when I was 19, shopped it around a bit and learned very quickly just how many different ways someone can tell you no. I was in college at the time, and working full time to pay for it, so that book eventually got put in a drawer, like so many early books do. Flash forward six years—I’d graduated, moved to NYC and scored a job in publishing. I picked up a few tricks, pulled the old book out of the drawer, did a quick edit and sent it out again. This time I got a bunch of full requests but still, no dice. Meanwhile I started working on another book—one I still love about an evil imaginary friend who steals a young girl’s imagination. A bunch of agents liked it but no one thought it would sell (smart advice.) I wrote ANOTHER book and this one got me an agent but publishers weren’t on board. It didn’t sell. I was devastated. I went to a friend’s birthday party around that time and spent the night talking to an editor friend of hers about how difficult the industry was, etc. etc. She mentioned they were looking for a horror novel. That was in July. By November of that year, I’d sold THE MERCILESS. Seriously, the AHA! moment was that night at the birthday party when the editor said ‘teen horror’ to me. I’d been writing a lot of middle grade stuff up until then, and I could never figure out why it wasn’t working. I got a lot of notes about scenes being too scary, or characters too mature, but it didn’t occur to me to write horror until that moment. I work at a writer’s space in New York City. It’s this huge room filled with cubicles where no one’s allowed to talk. They keep it too cold so I always have a thick sweater on. A useless radiator spits and hums in the corner. I need good coffee and a good pen, and I can’t write if there’s loud music playing, or if someone’s having a particularly interesting conversation nearby but that’s about it. I spent years and years and years writing whenever I had a few minutes of free time (which wasn’t often) so I got very good at typing into the Notes app in my phone, or scribbling in a Moleskine in my car or coming up with scenes in my head while waiting in line at the pharmacy. Having a ritual wouldn’t have made sense then—I had to grab the writing time when I could find it. For years, I had this stupid joke taped to the wall above my desk: What do you call a writer who never gives up? Published. So there it is—my brilliant advice: Don’t give up. Don’t compare yourself to other writers. Keep reading. Those are the three most important things any writer can hear—no matter where they are in their career. It’s a secret! I’m hoping that I’ll be able to announce it soon but for now let me leave you with these three clues: Bunny. Christmas Cookies. Snow storm. Desperate for help, Casey and her friends find themselves running through the putrid subway tunnels, searching for a way out. But every manhole is sealed shut, and every noise echoes eerily in the dark, reminding them they’re not alone. They’re being hunted. Danielle Vega spent her childhood hiding under the covers while her mother retold tales from the pages of Stephen King novels. Now an adult, she can count on one hand the number of times in her life she's been truly afraid. Danielle has won numerous awards for her fiction and nonfiction, and earned a 2009 Pushcart Prize nomination for her short story “Drive.” She lives in Brooklyn. 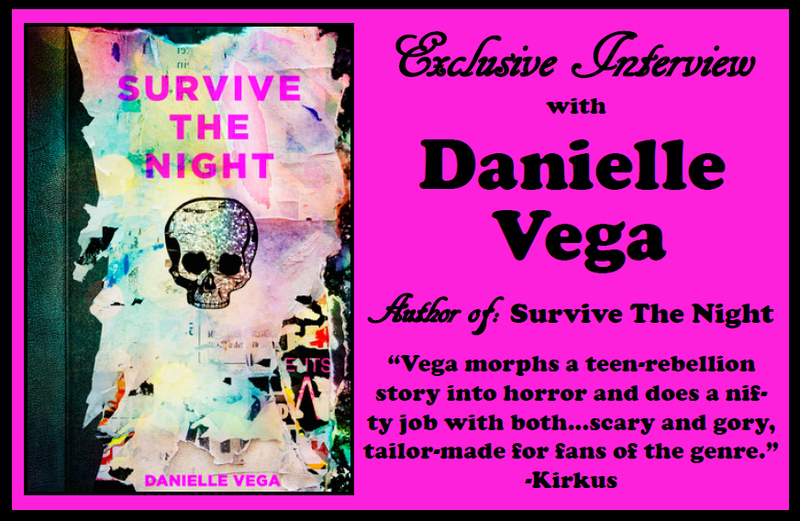 What did you think of our interview with Danielle Vega, author of SURVIVE THE NIGHT? Let us know in the comments!